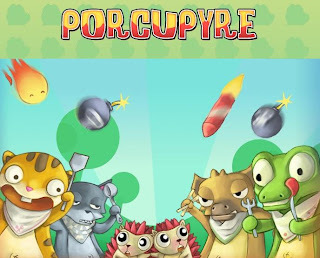 Porcupyre is a new point and click physics based puzzler from labugames. It's a fun little game where your goal is to fry up the members of the croc gang by strategically clicking spots in order to set fire to the platforms. However, you must not let the flames touch friendly porcupines that most of the time stands in your way. Aside from cute cuddly characters, this game features some nice music that puts the player in the mood for burning crocs. It has 48 unique levels with a puzzle difficulty that increases as you progress. Meanwhile, here is Porcupyre walkthrough showing the game's levels solved.